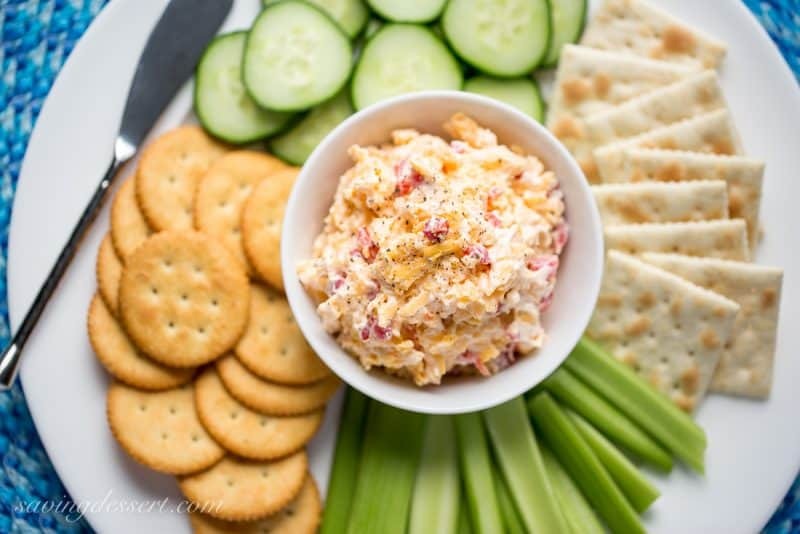 Southern-Style Pimento Cheese spread … the quintessential southern food. Actually pimento cheese is often referred to as the caviar of the south, but that’s another story. This simple spread reflects the laid back attitude you may find on a sweltering summer afternoon in the south, sitting on the front porch listening to the rhythmic hum of the cicada, drinking sweet tea. Parts of the south still move a little slower than the rest of the world, but I often believe that’s their way of keeping cool – because with all that humidity, it’s easy to break out into sweat! As a young girl in Tennessee, I remember my mother used to make pimento cheese in the summer months, and mostly on the weekends. My dad loved a pimento cheese sandwich for lunch after mowing the lawn or coming home from a round of golf. I can still see her shredding the cheese on a box grater, not measuring any of the ingredients, but making it perfectly every time. 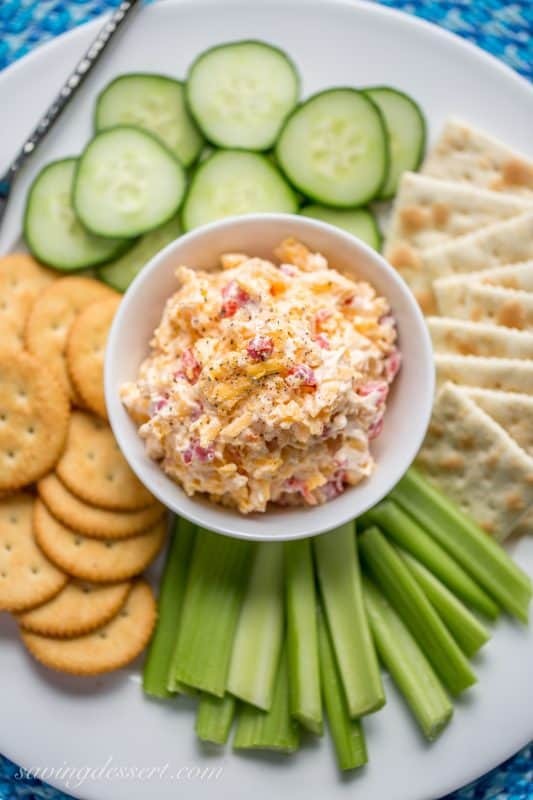 Most pimento cheese recipes have the basic four ingredients: mayonnaise, cheddar cheese, diced pimentos and seasonings. From there the options seem endless. I still like the basic recipe the best, with a little heat to give it that zing! This was a special request by my husband who also remembers his mother making homemade pimento cheese when he was a little boy. Food memories are so sweet! Check the seasonings and feel free to jazz it up a bit with minced jalapeño or your favorite hot sauce. 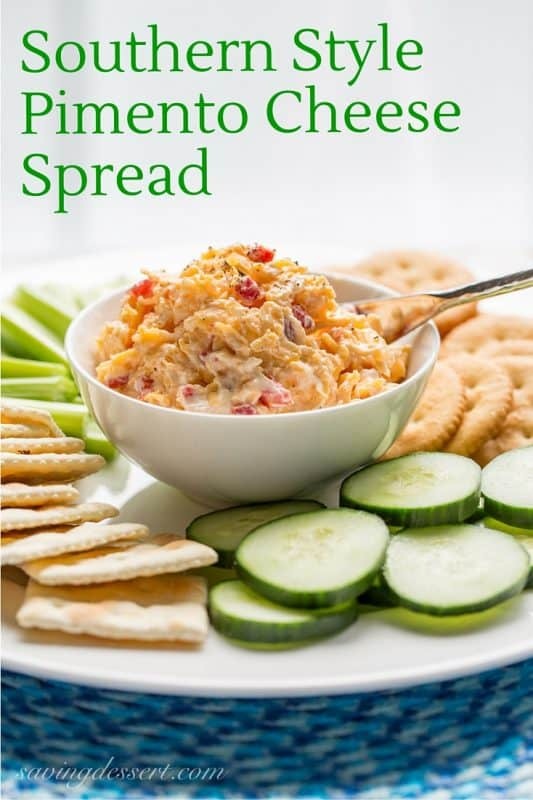 There are other recipes for pimento cheese that also include mustard, Worcestershire sauce, garlic powder, and maybe onion powder. This is a basic recipe like my mother made but my husband did add a little extra sprinkle of cayenne. Be careful not to add too much salt if you’re serving it with crackers. If you want to tone down the extra-sharp cheddar cheese, use half Monterey Jack instead. That about covers it ya’ll! Let’s be cooking friends! If you make our recipe please feel free to leave a comment on this post. I’m sure your experience and insights will help all our readers, and it helps me too. Also, if you’re on Pinterest feel free to leave a comment and photo there if you have one! If you share on INSTAGRAM tag @savingroomfordessert so we can stop by and give your post some love. And we’d be very happy if you’d FOLLOW Saving Room for Dessert on FACEBOOK| INSTAGRAM| PINTEREST | TWITTER and subscribe to our YOUTUBE channel for all the latest recipes, videos and updates. Thank you!!! A simple cheddar cheese dip served with crackers, vegetables or used as a sandwich spread and t's even terrific on grilled cheese! Shred the cheese on a large box grater and add to a large mixing bowl. Add the drained pimento and set aside. Blend together the mayonnaise, cream cheese, cayenne, Tobasco, pepper and seasoned salt until smooth and creamy. I used a small food processor that came with my stick blender to blend these ingredients. Works great! Add the mayonnaise mixture to the cheese and blend with a spatula until combined. If you do decide to purchase something at Amazon after following my link, I receive a small commission, at no additional cost to you, which I use to pay for web hosting and services for this blog. I can still bring out the southern girl accent if I have a glass or two of wine. I made a great effort to get rid of the accent after moving to Colorado in my early 20’s where I was teased mercilessly. I remember working for a man from Baltimore and he asked me what “fixin to” meant. Sheesh – I’m fixin to tell you something for sure. Hehehe. Happy Friday my friends! Thanks so much for stopping by and have a lovely weekend! I keep saying I’m going to try making southern pimento cheese but still haven’t gotten around to it! Your beautiful photos are an inspiration to me. After all, we do live in southern Wisconsin 🙂 I have to try it next time the family comes for dinner! I’ve seen pimento cheese prepared on many cooking shows but I have never had it. Your platter looks so tempting…I really want to try it right now. Excited for the countless sandwiches and burgers I can make with this! Hi Tricia, I have heard of this cheese before, sounds delicious. Sounds like you have such wonderful childhood memories. Hi Larry – this can go a bit hotter if you ask me 🙂 Nothing like a little cayenne and Tabasco to liven things up! What a pretty plate! People must queue to be invited to your home, Tricia. Off to buy a jar of pigmentos! Can’t wait to try it..and especially with cream cheese in the recipe. I plan on spreading on toasted pita bread. Yummy!! Annie that sounds great. I love flatbreads of any kind – but am very fond of pita. They are so easy to make too 🙂 Enjoy and thanks for the comment! Pimento and cheese is one of my all time favorites – just ask my kids! And, of course, it is one of two sandwiches served at the Master’s Golf tournament in Augusta (the other is egg salad). My mother sometimes adds sliced green olives to the mix, sometimes celery, sometimes green onions. You’re right – the seasonings are endless. I usually add a dash of Worcestershire to mine and sprinkle with paprika. I love to serve with celery, carrots, and Fritos (the scoops of course). But my favorite sandwich is a pimento & cheese, bacon, lettuce and tomato (PCBLT) on toasted bread – that’s a southern summer in a sandwich! Briana I would eat anything your mother made – or anything you make too! These are all great ideas but I am particularly interested in your PCBLT – wow that sounds perfect! I was thinking about a grilled pimento cheese with bacon – but why not add the vegetables too 🙂 Brilliant – thanks for the comment! Accents are part of who we are Tricia , I still have a German accent after so many years of living here. I will have to try Chris’s idea of adding your pimento spread to my hamburger and lets not forget the bacon. I bet you have a lovely accent Gerlinde 🙂 Sometimes a southern accent is associated with being a little less smart – which is not at all the case! I love Chris’s idea too – can’t wait to try it and was thinking about a grilled cheese with bacon and tomato – yum! I was absolutely reading your mind Betty – haha – you were transmitting your pimento cheese craving over to my house 🙂 I thought about adding the jalapeño but skipped it this time. Love the Virginia accent – it is pretty different than Tennessee and Georgia. Have a lovely (hot) weekend! 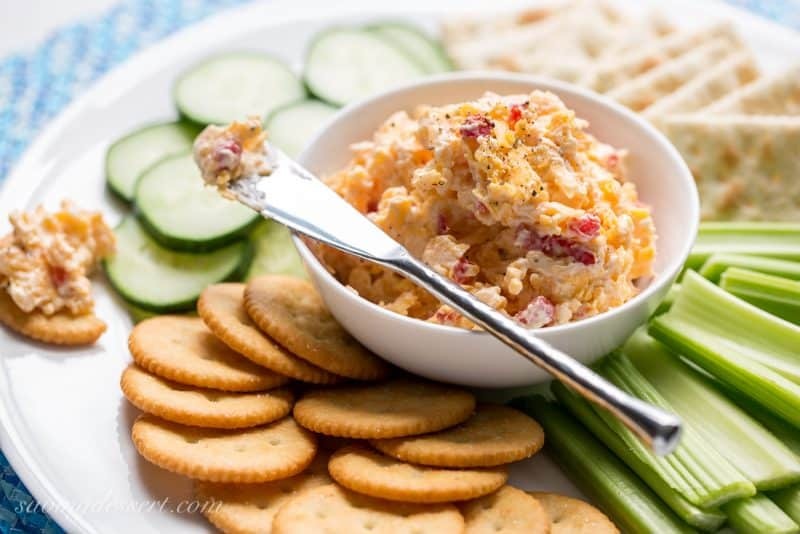 Growing up in Virginia, we always had pimento cheese in the refrigerator during the summer. My grandmother made the tasty treat with very similar ingredients. She would add sweet pickle juice to the mixture to make it more spreadable. Not many here in the Chicago area are familiar with the tasty treat. You certainly cannot find it in grocery delis. Hi Bonnie! I love your grandmothers idea of adding pickle juice – my husband will love that. It certainly is a southern thing and I like Chris’s idea of spreading it on a burger with bacon! What a treat 🙂 Have a great weekend. Thank you Becky! You are so sweet – just like ice tea (with an accent!) Have a great weekend! I don’t think I’ve had pimento cheese since I was a kid but I sure do remember feeling like a grown-up when we had it. It was always something to look forward to and you’ve taken me back to some beautiful memories today. Thanks, Tricia. I’m going to make this for our next family gathering! I haven’t had it in a long time either – it was a nice change and I can’t wait to make a grilled cheese sandwich with it this weekend! Thanks for stopping by! We used to have a Philadelphia pimento cheese that my mom loved..this looks good! You are too cute Monique! Southern Canadian accent? So funny. Philadelphia pimento cheese – sounds like the same thing to me! Have a great weekend. I have never had pimento cheese…the dip sounds and looks really great, Tricia. Must be a southern United States kind of thing. Maybe you can start a trend in Germany Angie! Haha – have a great weekend! After reading Chris’ comment I’m now craving a burger slathered with this stuff! Me too Sue! Have a wonderful weekend. I am so intrigued by pimento cheese! I have never had it as it’s not really “a thing” here in Canada, but that said, by the looks of this, it definitely should be 🙂 This is on my list to make this summer and I’m taking a cue from Chris and putting it on a burger with bacon, because why the heck not. My husband liked the idea posted in a comment by Bonnie, of adding pickle juice so I think he’s going to try it. I’m going to have my pimento cheese grilled cheese sandwich this weekend 🙂 Thanks so much Jennifer! Now that sounds like a great way to use Pimento Cheese Chris! You have everyone craving it now 🙂 Have a happy weekend and thanks so much for stopping by!